Amélie Marian is an Associate Professor in the Computer Science Department at Rutgers University. Her research interests are in Personal Information Management, Ranked Query Processing, Semi-structured data and Web data Management. 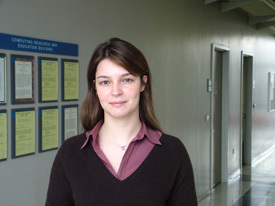 Amélie received her Ph.D. in Computer Science from Columbia University in 2005. She received B.S. and M.S. degrees from Université Paris Dauphine, France in 1998 and 1999, respectively. She is the recipient of a Microsoft Live Labs Award (2006), three Google Research Awards (2008, 2010, and 2012) and an NSF CAREER award (2009).